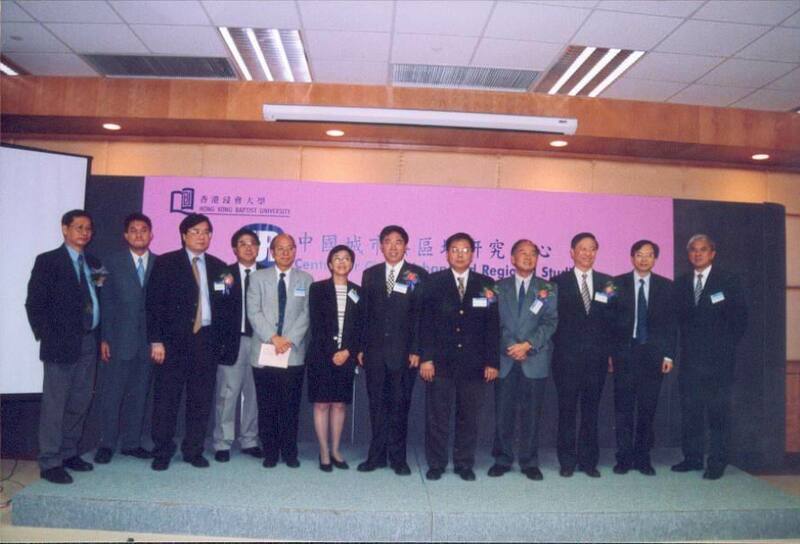 The Inauguration Ceremony of the Centre for China Urban and Regional Studies (CURS) was held on 8 November 2001 at the Lam Woo International Conference Centre, Hong Kong Baptist University (HKBU). We are so thankful for the ardent support from all participants, particularly our geusts of honour Prof. NG Ching-fai, President and Vice Chancellor of HKBU, and Hon YEUNG Yiu-Chung, Principal of Heung To Middle School. They respectively delivered opening addresses and officiated the ribbon cutting at the ceremony. 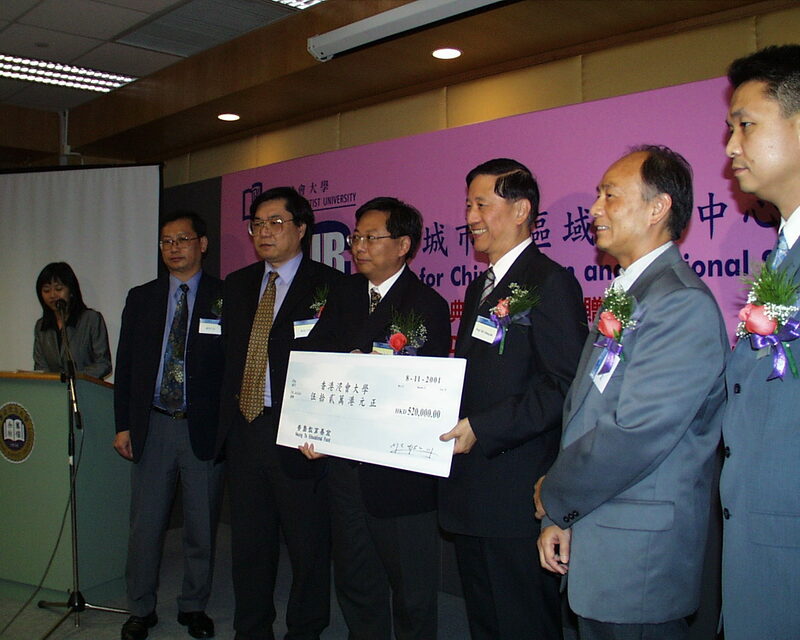 Great acknowledgement, as well, to the Hueng To Educational Fund for its generous donation of $52,100 HKD to support the research endeavours of the CURS. Ribbon Cutting, officiated by (from right) Prof. LI Si-ming (李思名教授), Prof. NG Ching-fai (吳清輝教授), Hon YEUNG Chiu-chung (楊耀忠校長), and Prof. XU Xueqiang (許學強教授), benchmarks the official opening of the Centre for China Urban and Regional Studies. Acknowledgement to the Hueng To Educational Fund (香島教育基金) for its generous donation of $52,100 HKD to support the research endeavours of the Centre for China Urban and Regional Studies. The official opening of the CURS was immediately followed by two public lectures. We are so honoured to have Sir Wu Ying Sheung, Chairman and Managing Director of Hopewell Holdings Ltd., and Prof. Xu Xueqiang, Director of the Centre for Urban and Regional Studies, Zhongshan University, to be our guest speakers. They spoke respectively on the land use and transbounday transport development of Hong Kong, and the development of the western region of China. Last but not the least, many thanks to the kind supports from all participants, and great gratitude to all parties who had contributed to the Ceremony. Group photo among some of the participants of the CURS's Inauguration Ceremony.